Our 160-220HP wheeled tractor is offered with 400L large capacity fuel tank, supporting long distance driving. Moreover, the supercharged air/air inter-cooled diesel engine consumes less fuel during operation. You can see an immediately improvement in your working efficiency, and the reduction in your energy usage. 1. Our eco-friendly tractor has good adaptability by virtue of the adjustable single or double-acting multi-way valve, as well as the 3 or 4-group of hydraulic outputs. 2. There is an electro-hydraulic control suspension mounted at the rear of the product. So, trailer can be connected to the 160-220HP wheeled tractor rapidly and conveniently. 3. Specially, this range of product is designed with double rear wheel for vigorous drive. Moreover, the stepless adjustable wheel track makes it available for the farm crops indifferent row spacing. 4. The fully enclosed cab has wide vision. Equipped with heater, air conditioner, and audio and air dust filtering system, this agricultural vehicle may bring the driver comfortable and healthy working environment. 5. Convenient and practical, our 160-220HP wheeled tractor is engineered with one-key electro-hydraulic control differential lock. 6. Controlled by electronics and hydraulics, the independent two speed PTO output makes for convenient control. 7. The hydraulic wet self-booming brake with multiple discs has optimal safety and reliability. 8. The hydraulic steering system can be manually controlled through the operation on the adjustable steering wheel. 9. Our compact four wheel drive tractor is engineered with clutch control mechanism boosted by air pressure. 10. The symmetrical front drive axle from CARRARO, together with the mid-mounted transmission shaft, makes for easy and flexible operation. 11. With the installation of the synchronizer for 12F+4R gear, user can enjoy the impact-free and noise-free gear shifting. 12. 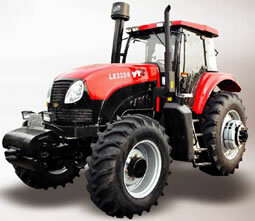 The 160-220HP wheeled tractor is manufactured with the transmission system produced based on Italian technology. Particularly, the forced cooling and lubrication system is conducive to the reliable operation with heavy load.